I'm in the process of writing Milly's birth story. I really never noticed just how long-winded I can be though - it's already two Word pages long, and I haven't even reached the part where I went into labour! All I've written is just the pregnancy story... Oops! I'm waiting to get all the photos together, too, so I won't be posting it until then. I promise I'll make it worth the wait though. Really. 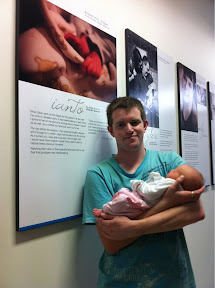 Also regarding photography, when Milly was six days old we went to the Heartfelt Exhibition! After looking forward to it so much, we finally got to go along... And it was worth the wait. So many photos and stories - and everyone was so nice there, cooing over Amelia and asking about Ianto's picture. It was the one I have in the header of my blog, the one of his feet. I felt so proud of both my babies. That's so great that you are writing a really detailed birth story! I really need to do that still. Thank you for your kind comment on my blog. I'm glad to be visiting yours! Teni, that is a gorgeous photo. It brought tears to my eyes. I hope they bring the Heartfelt exhibit to other states. I look forward to reading your birth story! Well done and congrats again on little Amelia's arrival! Not sure if you saw my Twitter comment about this post, so I'll say it again.